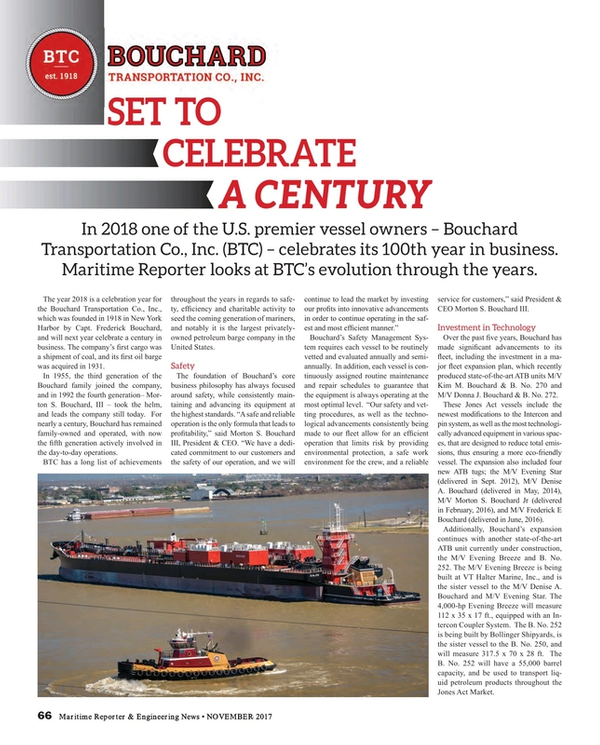 In 2018 one of the U.S. premier vessel owners – Bouchard Transportation Co., Inc. (BTC) – celebrates its 100th year in business. Maritime Reporter looks at BTC’s evolution through the years. The year 2018 is a celebration year for the Bouchard Transportation Co., Inc., which was founded in 1918 in New York Harbor by Capt. Frederick Bouchard, and will next year celebrate a century in business. The company’s first cargo was a shipment of coal, and its first oil barge was acquired in 1931. In 1955, the third generation of the Bouchard family joined the company, and in 1992 the fourth generation– Morton S. Bouchard, III – took the helm, and leads the company still today. For nearly a century, Bouchard has remained family-owned and operated, with now the fifth generation actively involved in the day-to-day operations. BTC has a long list of achievements throughout the years in regards to safety, efficiency and charitable activity to seed the coming generation of mariners, and notably it is the largest privately-owned petroleum barge company in the United States. Bouchard’s Safety Management System requires each vessel to be routinely vetted and evaluated annually and semi-annually. In addition, each vessel is continuously assigned routine maintenance and repair schedules to guarantee that the equipment is always operating at the most optimal level. “Our safety and vetting procedures, as well as the technological advancements consistently being made to our fleet allow for an efficient operation that limits risk by providing environmental protection, a safe work environment for the crew, and a reliable service for customers,” said President & CEO Morton S. Bouchard III. Over the past five years, Bouchard has made significant advancements to its fleet, including the investment in a major fleet expansion plan, which recently produced state-of-the-art ATB units M/V Kim M. Bouchard & B. No. 270 and M/V Donna J. Bouchard & B. No. 272. These Jones Act vessels include the newest modifications to the Intercon and pin system, as well as the most technologically advanced equipment in various spaces, that are designed to reduce total emissions, thus ensuring a more eco-friendly vessel. The expansion also included four new ATB tugs; the M/V Evening Star (delivered in Sept. 2012), M/V Denise A. Bouchard (delivered in May, 2014), M/V Morton S. Bouchard Jr (delivered in February, 2016), and M/V Frederick E Bouchard (delivered in June, 2016). Additionally, Bouchard’s expansion continues with another state-of-the-art ATB unit currently under construction, the M/V Evening Breeze and B. No. 252. The M/V Evening Breeze is being built at VT Halter Marine, Inc., and is the sister vessel to the M/V Denise A. Bouchard and M/V Evening Star. The 4,000-hp Evening Breeze will measure 112 x 35 x 17 ft., equipped with an Intercon Coupler System. The B. No. 252 is being built by Bollinger Shipyards, is the sister vessel to the B. No. 250, and will measure 317.5 x 70 x 28 ft. The B. No. 252 will have a 55,000 barrel capacity, and be used to transport liquid petroleum products throughout the Jones Act Market.